I have been eating dandelions more and more lately. I don't always forage for them myself. Dandelion greens are actually available quite often in the organic produce section of grocery stores. I also signed up for a Community Supported Foraging program run by Wild Infusions in Love, Saskatchewan. They deliver one box a month, sent by bus, full of wild-foraged foods and medicines, like Labrador tea, wild rose petals, nettles, wild mushrooms, and of course, dandelion greens. Dandelions, while the bane of lawn enthusiasts, are drastically undervalued as a food and medicinal plant. They exist in North America because European immigrants brought the seeds with them. They considered dandelions so useful they couldn't imagine life without them. And now, it's hard for us to imagine life without them, too. But only because they are such a widespread weed. The entire dandelion plant is edible. If you ever dared to taste one of the flowers, you'd be amazed how sweet they are. The leaves can be substituted for any dark, leafy green. Just be aware that they are sometimes quite bitter. If you are not accustomed to bitter flavours, it may be an acquired taste. But that bitter flavour is one of the tell-tale signs that dandelions are really, really good for you. My sister studies herbology, and she is adamant that everyone should include more dandelion in their diet. They are considered a liver and kidney tonic, and help cleanse the body and improve digestion. Occasionally I try to wean myself off coffee, and when I do, I often use Dandy Blend, a commercially available coffee substitute, containing dandelion root, that I find surprisingly enjoyable in spite the lack of caffeine. So if you were wondering what you might do with those pesky plants studding your lawn, here are a few ideas, curated from the internet, to get you started. 3. Replace any dark leafy greens or wild greens in a recipe. I did that for this Hortopita, combining dandelion greens and chard mixed with feta cheese. My kids weren't keen on the bitterness, and my husband topped it with more cheese and said he liked it then. I liked it as is. 4. Make liqueur! Jenieats offers a guideline for cordial. I have tasted dandelion mead, made from dandelion honey, which was delicious. I love making liqueurs, because they tend to really capture the flavour of whatever fruit or herb you use. I'm going to have to try this. 5. Make dandelion cookies. Yes, you heard that right. My sister swears by them. 6. Make dandelion fritters. Sweet or savoury! Eat The Weeds offers a nice list of recipes, from dandelion bread to dandelion wine. The Kitchn offers up another 10 dandelion recipes that all sound delicious. Try them! I get the sense that you can use them anywhere, in anything. If you need me, I'll be out picking dandelions. Note: be sure you are foraging from a pesticide-free zone! Thank you for your patience, dear readers. I have been away far too long, working under an insane deadline for a web content project. I had so much more time for blogging when I wasn't working full time! But I would like to share my own recent experience with a Date Night In. I was inspired by a speaker at last year's Food Bloggers of Canada conference. Ashley Rodriguez, of Not Without Salt fame, was about to release her second book, titled Date Night In. The idea sounded intriguing. Something I hadn't even considered before. When my kids were smaller, and I was more housebound overall, the concept of a date night in sounded horrible. I just wanted to get the hell out. Besides that, I was struggling to continue as a local dining columnist, which meant any and every rare date opportunity had to involve dining out at my next review location. Now that my kids aren't waking up every two hours to nurse, and we can get through a movie from 8:30 to 11PM without someone waking up crying, and now that the intensity of my work life has increased exponentially (it's good, I'm not complaining), I find the prospect of a quiet night at home, eating dinner together after the kids go to sleep, much more appealing. "If you're going on a date, who will look after us?" We're not going anywhere, sweetie, we'll be right here the whole time. "How come I never get to have a date?" How do I even answer that? What can I say kid, you live a life of abject deprivation. My own challenge with the concept of a date night in after kids are in bed is that we'll be eating late. The idea of a heavy meal late in the evening didn't really appeal to me. My husband wasn't much help. When I asked him what he'd like to eat on our 'date', he said, "well, steak sounds good..." Good, yes. Not so much on the light side though. My own approach, whenever I get to cook a meal that my kids aren't going to eat, is to fit in the things that I like that they don't: spice! mushrooms! I started building a meal plan around steak, using what we had in the house as much as possible, and also fitting in some of my cravings, while not going overboard with dishes that were too heavy so late at night. ...and red wine of course...Altos de Luzon to be exact. The Universe stepped in to up the romance quotient. The steaks were seasoned, the squash was roasting, and I was just prepping the ingredients for the braise, when I suggested to my husband that he light a fire in the fireplace. Then the power went out. "I guess I'd better light the fire sooner than later, eh?" he said. First he got some candles so I could continue preparing dinner. I did a quick inventory of what needed an alternate fuel to electricity. My range is gas, but the oven is a combination of gas and electric, which means it kicked out when the power went out. I decided to switch the pan of roasting squash to the outdoor grill, hoping that we had enough propane for both the squash and the steaks. We didn't have enough propane in the tank that was on the barbecue, but we had a backup, so my husband did some scrambling, swapping out propane tanks, hauling in wood, and lighting a fire. 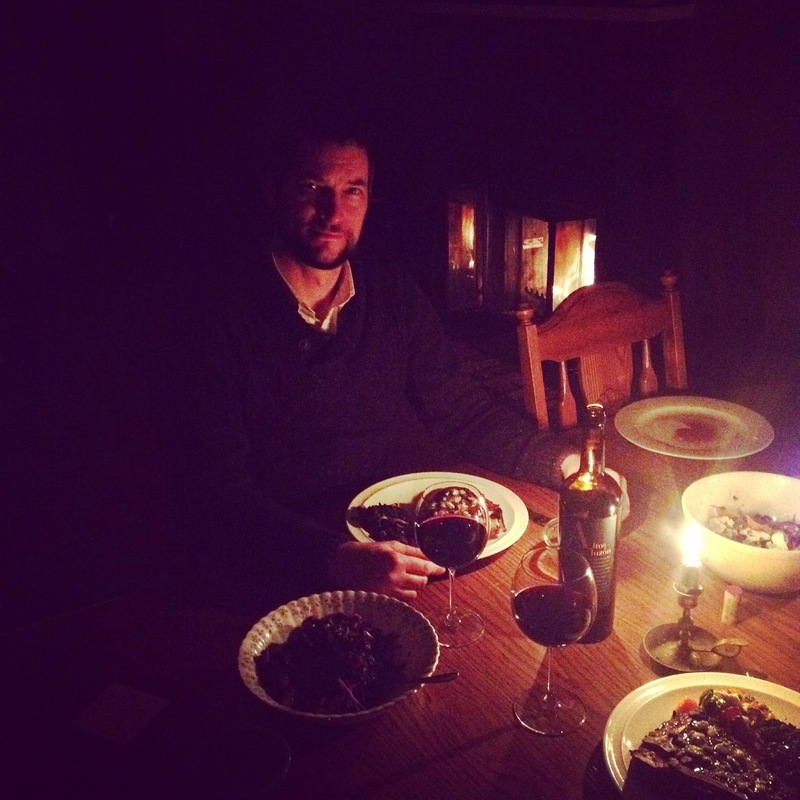 Our meal was by far more romantic by candlelight. So much so, that when the power came back on midway through, we just turned out the lights and continued with the candlelight. I was relieved that we wouldn't have to worry about frozen pipes or piling the kids into our bed to keep warm without a furnace overnight. Modern convenience is much preferred, even if it means candlelight is optional. Romantic candle-lit dinner for two; who wouldn't love a date night in? Our meal was wonderful. I was pleased with how all the flavours blended. We hit all the elements: sweet squash, spicy onions, creamy goat cheese, pungent blue cheese, earthy greens and mushrooms... I marvelled at how everything that goes well with steak (robust greens, garlic, mushrooms, sun-dried tomatoes, red wine) can be found in a vegan side dish (oh, the irony). We finished our meal warm, comfortably full, with the flavours still swirling on our tastebuds and ready to skip dessert in favour of more romance. We're sold on date nights in. I'll keep you posted on the next one!